The College Football Playoff national championship is set with Georgia and Alabama advancing in the semifinals on New Year’s Day. And we have an undefeated team for the first time in College Football Playoff history that few will end up remembering much of outside of Orlando (and Lincoln, Nebraska), and that’s a darn shame. The Grandaddy of Them All again lived up to the hype. In the first-ever meeting between Georgia and Oklahoma, the two offenses put on a show and this one needed a double encore. Georgia running back Sony Michel took a direct snap in double overtime and sped his way through a hole, followed a block, and zipped into the end zone for a walk-off victory in the first College Football Playoff semifinal game on New Year’s Day. For Michel, it was the perfect script for redemption after a fumble he lost midway through the fourth quarter was returned by Oklahoma for a go-ahead touchdown to break a tie. Fortunately for Michel, the college football gods watching from above decided to provide a shot at redemption and he took advantage of it. Georgia’s rushing attack was a two-headed monster all night long against the Sooners, and there was very little Oklahoma could do to slow it down. In fairness to the Sooners, not many teams could thwart Georgia’s running game this season, and Oklahoma’s strong suit hasn’t been their defense. Nick Chubb rushed for 145 yards and two touchdowns on just 14 carries. Michel carried the football 11 times for 181 yards and three touchdowns, including the Rose Bowl double-overtime clincher to send Georgia to its first outright national championship game. It was fitting that Michel would get the winning score, and good luck to Alabama finding a way to slow down Georgia’s running game. Baker Mayfield will be the first Heisman Trophy winner in the College Football Playoff not to reach the national championship game. 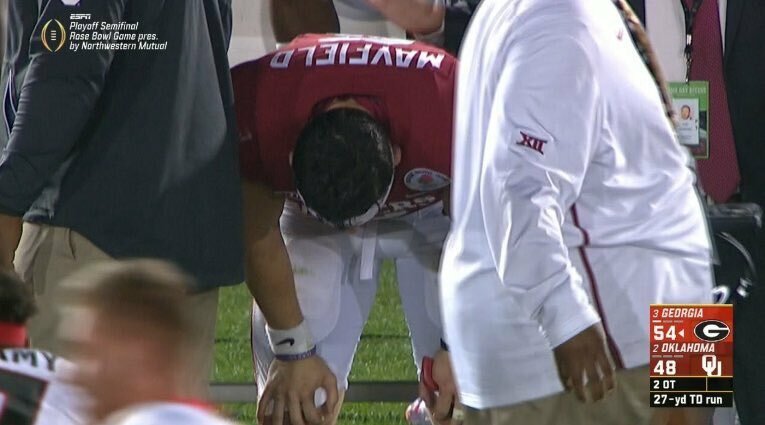 Credit Georgia, of course, but it just felt as though Mayfield was given an opportunity to deliver Oklahoma a win and just could not get the team to the finish line. The playcalling left something to be desired in the clutch, although Lincoln Riley had come to expect Mayfield might make a play when Oklahoma needed it the most. In the Rose Bowl, that was not the case. On 3rd and 2 from the Oklahoma 45-yard line, Mayfield attempted a low-percentage shot down the right sideline that fell incomplete. With 17 seconds left on the clock, Oklahoma punted away rather than risk being stopped on fourth down near midfield and give Georgia a chance to win it in regulation. With the way the game was going, it was clear Oklahoma was not going to be able to survive by settling for field goals. Not in what turned out to be the highest-scoring game in Rose Bowl history. (The 102 points eclipsed last year’s Rose Bowl between USC and Penn State with 101 points scored in 60 minutes). In the first overtime, Mayfield attempted one pass, a four-yard gain on second down before a run by Jordan Smallwood was stuffed for a one-yard gain on 3rd and 2. It was an awkward play and Georgia was ready for it. Oklahoma settled for a field goal after just three plays to force a second overtime. 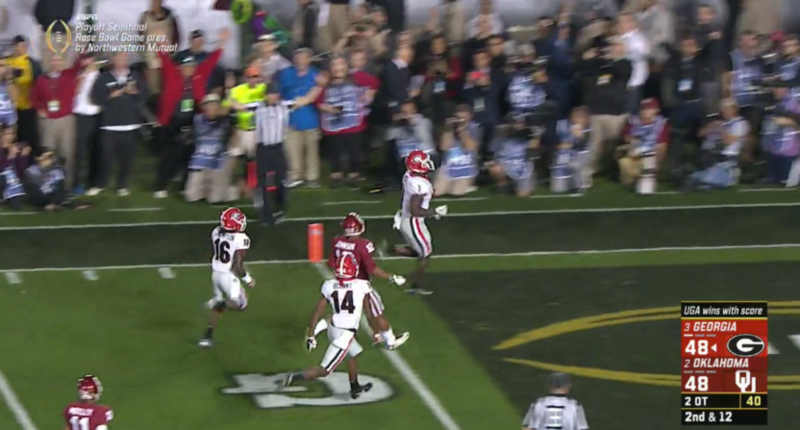 In the second OT, Mayfield took a shot to the end zone on a free play after Georgia jumped offsides, but the pass was picked off (which was nullified by the offsides). Mayfield made the right decision to try a shot to the end zone on the free play, although in hindsight, maybe there was a more effective play that he could have chosen instead. Mayfield’s next pass to Rodney Anderson went for a two-yard loss on a 3rd and 10, and Mayfield’s next pass to Marquise Brown was only good for seven yards to leave Oklahoma to settle for a 27-yard field goal attempt, which was missed. Even if the field goal had been made, Michel’s heroics would have sent Georgia to the national championship anyway. But in overtime, Oklahoma needed Mayfield to be the hero and it just did not happen. Mayfield’s legacy at Oklahoma will be a positive one, yet it will be one with an 0-2 record in the College Football Playoff. That is tough because Mayfield has been one of college football’s best players over the past few years and he won’t get that one last shot at a national title. The only debate worth having this season was whether or not the fourth seed in the College Football Playoff should go to a one-loss Alabama that didn’t play for the SEC championship or a two-loss Ohio State team that won the Big Ten conference championship game. The reality is there was no perfect answer to the question and the choice was between two flawed candidates. The committee chose Alabama for being more consistently good all season, while Ohio State’s bruises from a road blowout loss to Iowa were too much to look past despite a handful of superior victories that Alabama lacked. On Monday night in the Sugar Bowl, however, Alabama showed why the committee made the right choice. Jalen Hurts was efficient and reliable with two touchdown passes to guide the Alabama offense, but it was the defense that took care of business in New Orleans. Alabama kept Clemson out of the end zone all night, a feat not done by a Clemson opponent since Georgia Tech handed the Tigers a 28-6 loss in the middle of November 2014. Clemson was a different team then, just learning to become a team capable of going on a national title run. And despite how good Clemson was in big spots this season, Alabama manhandled them and even threw a defensive lineman out on offense to haul in a touchdown pass just moments after he came up with a big defensive turnover. It was a dominating performance from the Crimson Tide that left no doubt they were, in fact, one of the four best teams in college football this season. We don’t know for sure how Ohio State would have fared against Clemson, and it would be unwise to suggest what happened the previous year in the College Football Playoff would have any bearing on this season. As we saw, this Clemson team is different from the one Deshaun Watson led to a national title and a rout of Ohio State in last year’s Playoff. But we know what Alabama did against this Clemson team, and the selection committee can feel justified in their decision-making. Of course, had Ohio State been in the game and beaten Clemson, the committee would have felt justified in that decision as well. The truth is, Alabama winning didn’t really prove anything with the committee. But it did prove Alabama was worthy of being in the Playoff. UCF did it. The Knights completed a perfect 13-0 season with a thrilling victory over Auburn in the Peach Bowl in Atlanta on New Year’s Day, sending head coach Scott Frost off to his new job at Nebraska in style and giving the American Athletic Conference one more argument to be considered the sixth power conference in the country. For the first time in the College Football Playoff era, we will have an undefeated team at the end of the regular season, and that team will not be recognized as a national champion except in the minds of perhaps a couple of AP voters and a computer ranking. And UCF’s athletics director. UCF is going to get #1 votes in the final AP poll. It won't be very many. But every single one will mean a lot to the program, and possibly to the future of CFB. It has to be mentioned that UCF beat the one team in the country that managed to defeat two No. 1 teams during the regular season. Both of those teams are also playing for the national championship next week. Auburn knocked off both Georgia and Alabama in the month of November, handing each their only losses this season. So what do we make of UCF and the season they just had? In the years to come, UCF’s undefeated run will largely be forgotten and left in the shadows of this year’s College Football Playoff, which will feature two SEC teams duking it out for the national title. UCF may end up being no higher than No. 3 in the final polls, and it is not unrealistic to think they may reach no higher than fifth given how the polls have played out this season. But UCF should absolutely be no lower than third in the final polls. They defeated the one team to beat both Alabama and Georgia and they are undefeated. The Knights may even be able to hang with Georgia or Alabama (or Oklahoma or Clemson) in a head-to-head matchup. We will never know for sure, but we can end this season knowing that UCF was without a doubt one of the best teams in the country, even though they did not get an opportunity to compete for the national championship. Until the College Football Playoff expands to an eight-team format that guarantees a spot to the highest-ranked Group of Five champion, this will continue unless a Group of Five team stacks up one or two victories against a power conference opponent in the regular season. Despite the AAC’s depth and its positive bowl results this season (4-3 in bowls, 3-1 vs. ACC/Big 12/SEC), the best the Group of Five has to offer will be left out in favor of one-loss teams from power conferences. UCF did have a game scheduled against Georgia Tech that was canceled by a hurricane, but a win against the Yellow Jackets would not have been enough to lift UCF into the Playoff discussion. The selection committee held UCF down throughout the season once they started making the rankings every week, giving the Knights no respect for their accomplishments. While I agree with the viewpoints favoring other teams ahead of UCF during the regular season, I also felt the Knights deserved a higher ranking than the committee gave them. I would not have had UCF in position for the four-team playoff, but they also would have been in my top 10. With a new head coach next year in Josh Heupel, two games against ACC opponents (at UNC, home vs. Pitt) and a matchup against Lane Kiffin’s FAU program next September, UCF will have an early chance to make a statement before jumping into the thick of conference play.